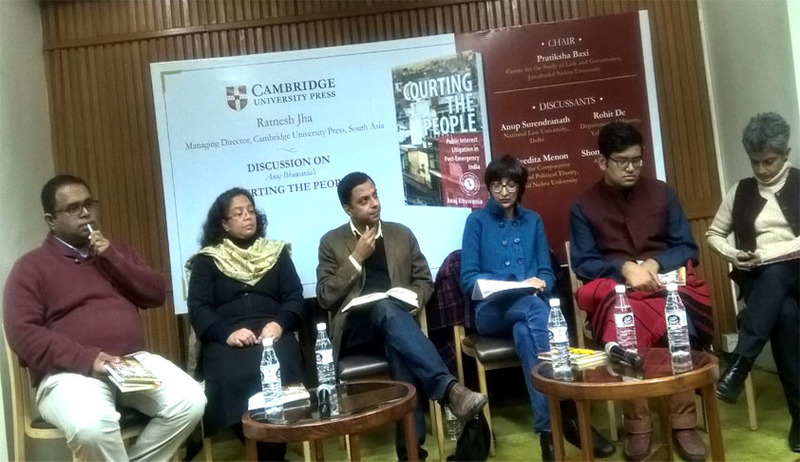 At a discussion held in India International Centre, New Delhi, on Monday, on Scholar & Academic, Anuj Bhuwania’s recent book, Courting The People: Public Interest Litigation in Post-Emergency India (Cambridge University Press), speakers debated the book’s premise that PIL is a tragedy to begin with, and has over time, become a dangerous farce. The author set the tone of the discussion by observing that much of the criticism of PIL is based on the view that PIL was mostly progressive in its early phase, but over time it has increasingly become regressive. However, his argument is that there is far more continuity in the PIL cases of these two periods than discontinuity if one focuses on the injustice of the judicial process adopted in them, rather than the unjust outcomes alone. Rohit De, Department of History, Yale University, said that PILs get disproportionate attention in the media, despite occupying a very small share in the court’s docket. He agreed with the author that lack of reasoning and contempt for the petitioners are some of the common features of PILs. He asked whether the ‘PIL bug’ has infected the entire system. Nivedita Menon of the Centre for Comparative Politics and Political Theory, Jawaharlal University, questioned the book’s premise that formalism was the solution to the problems of the Indian legal system. She said that the analysis of PILs in terms of their consequences is a legitimate exercise. Anup Surendranath, of National Law University, Delhi, was of the view that the Directive Principles of State Policy have come to increasingly define the Fundamental Rights, and the restrictions envisaged in Part III of the Constitution. “Its progression can be seen in the National Anthem Case”, he observed. Shomona Khanna, Advocate, shared her experience in forest and manual scavenging cases. According to her, the Supreme Court’s judgment in the manual scavenging case is a good one, but it involved a hard journey, with many ups and downs. Even the maintainability issue took so long to resolve, she recalled. She said that she would tell her client to explore other avenues, rather than go to the Supreme Court to get relief, considering the uncertainties in the Apex Court. Shomona recalled that a former CJI, while hearing the manual scavenging case, had observed that manual scavenging did not exist in the country, and wondered what the petition was all about. He then asked how the petition was maintainable, when there was already an Act for the purpose. Recalling another case before the Himachal Pradesh High Court, she said marginalised communities are either stuck in letter petitions, or forced to consider abandoning going to the courts at all. Pratiksha Baxi, of the Centre for Law and Governance, JNU, moderated the discussion. Replying to questions, Anuj Bhuwania explained that his critique of PIL is less a defence of formalism and more an attack on informalism. To look at the minuscule PIL numbers in the court’s docket is misleading, as one forest case is heard continuously for a number of years on so many days, he pointed out. PILs demonstrate how deep is the pathology in the legal system, he said. He agreed with another questioner, Gautam Bhatia, advocate, that PILs stifled civil rights, when the Supreme Court, instead of striking down laws, laid down guidelines, which were observed more in breach. There is a migration of PIL-style of resolving cases to civil rights cases, it was suggested. Kartar Singh, AFSPA, and PUCL-Encounter cases are examples of this trend, Bhuwania added. Replying to another question on what is wrong with compromising with procedure, when procedure itself is a problem, the author observed that procedure at least offers a fig leaf, but PIL enabled the Court to dispense with all procedural standards when it is convenient to it. 'Everything is Article 21, except the literal reading of Article 21', he said tongue in cheek. Bhuwania recalled an anecdote when the amicus in the vehicle pollution case opposed the lifting of restriction on the number of autorikshaws in Delhi at 55000, while he did not plead for a similar restriction on the private vehicles, because he reasoned autos cause traffic jams, as a result of which many vehicles become stationary, with their engines on, thus raising pollution levels. The PIL petitioner became an increasingly redundant figure, with the Court claiming its ownership, or substituting the Amicus Curiae in the place of the petitioner. The wrath of PIL is clearly a selective one. While judges have predilections like the rest of us, the rules of adjudication and court procedure act as constraints they have to work within. PIL removes any such limitation. The book concludes the chapter on PIL as Slum Demolition Machine, by observing that the judicial populism of PIL allows for a radical instability that continually pushes the limits of what a court can do. Another observation the book makes in the Chapter on Good Judges, Bad Judges, is that PIL was a Faustian bargain that its votaries have always been willing to make. The former Chief Justice of India, Justice M Hidayatullah, had in his “Highlanes and Bylanes of Justice”, published in SCC (2 Jour 1) in 1984 had predicted that PIL would result in the annihilation of all procedure.